Eat That Frog Start Kit by Brian Tracy Includes the following Brand New items. Personal productivity books are great?until you try to implement the advice inside. Taking the two-dimensional advice from a page and turning it into real life habits is the biggest challenge for many self-help devotees. 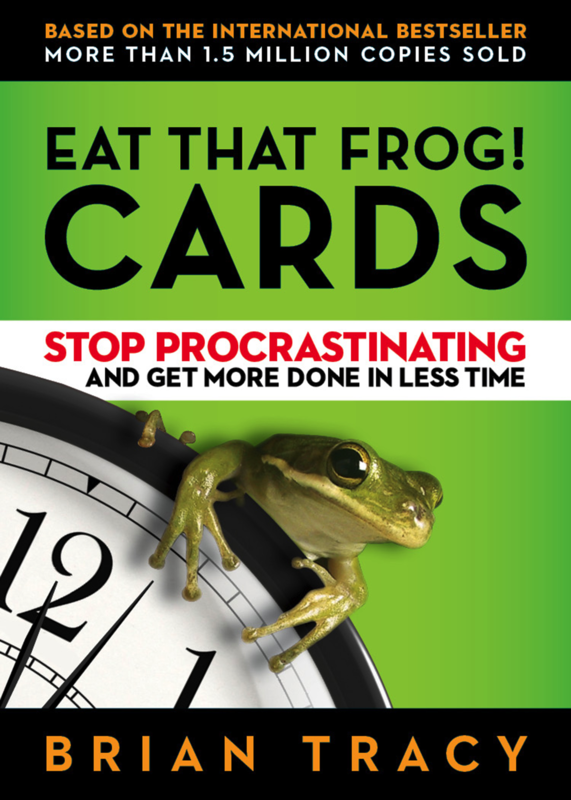 This card deck tackles that very stumbling block, offering interactive daily exercises, motivational self-rewards, and a plethora of ugly frogs to help readers take decisive action to take control of their time and Eat That Frog! Get More of the Important Things Done?Today! There just isn?t enough time for everything on our to-do list?and there never will be. Successful people don?t try to do everything. They learn to focus on the most important tasks and make sure those get done. They eat their frogs. There?s an old saying that if the first thing you do each morning is eat a live frog, you?ll have the satisfaction of knowing you?re done with the worst thing you?ll have to do all day. For Tracy, eating a frog is a metaphor for tackling your most challenging task?but also the one that can have the greatest positive impact on your life. Eat That Frog! shows you how to organize each day so you can zero in on these critical tasks and accomplish them efficiently and effectively. But one thing remains unchanged: Brian Tracy cuts to the core of what is vital to effective time management: decision, discipline, and determination. This life-changing book will ensure that you get more of your important tasks done?today! ?BEWARE: This book will have a profound impact on your working practices and the results you?ll achieve. Eat That Frog! challenges your working practices, it explains the self-discipline needed to succeed, and [it] firmly gets to the root cause of why people procrastinate. Then it effortlessly explains how to boost your productivity once and for all.? That Frog! offers a concise and valuable collection of tactics to try. The reasons for each person?s procrastination are different, so it?s good that Tracy?s tactics are fairly diverse and attack many different avenues of procrastination.? ?Eat That Frog! is my favourite book on productivity, and I often find myself rereading it in January to remind myself of the disciplines and practices I?d like to follow in the coming year. Each time I read the book, I find new nuggets of productivity gold.? 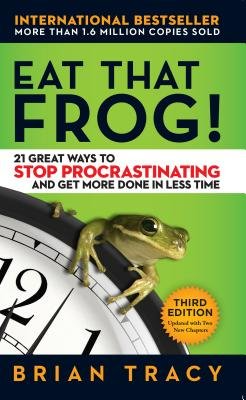 ?Everyone has a frog, and eating that frog is the best thing you can do to stop procrastinating. 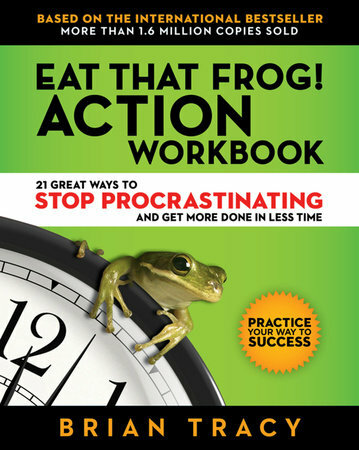 Procrastination is a time-killer, and Tracy has a way of making getting over that frog fun and exciting. Every chapter presents a new idea, tip, and technique that will help you overcome that inner laziness that keeps you on the couch at night instead of in the gym.? I have read zillions of books?and most of the time I can?t remember anything that I have just read. Not with this one. I?m eating frogs daily and feeling better for it! I can?t recommend Eat That Frog! enough.? ?This book gave me the kick in the pants I needed to organize my to do lists, plan my days, become more productive, and get focused.? ?Eat That Frog! is the most accessible book on time management and personal productivity?I recommend you read this one before you learn any particular time management system. There are tons of exercises and techniques that you can implement right away, and that is what I like the most about the book?it gives you actionable steps so you can start right away.? ?An impactful read. The 21 ways that [Tracy] shares are real game changers, if you read with an eye towards self-improvement and an intention to make a change. I have benefi ted greatly from this book, and I highly recommend that you pick up your own copy today.? ?We strongly recommend this book to anyone who wants to manage her time well and also add value to herself in this competitive world.? ?I wasn?t expecting all that much from the book initially, as the whole ?eating a frog? seemed like some new age nonsense that didn?t really apply in real life. I couldn?t have been more wrong. The best thing about this book is that it actually tells you what you should do. It doesn?t just spout philosophy after philosophy about dreams and hope. It gives solid, practical advice that applies to pretty much every one?students, employees, stay-at-home moms, entrepreneurs, etc. Whether you?re having time management issues or not, I?d recommend you pick up this book. You?re sure to learn something useful from it.? ?This book distinguishes itself from others of the same type by laying out specific guidelines for developing the self-discipline that allows you to start and complete important tasks in sequence. Each of the 21 chapters offers clear instructions and practice exercises to help you determine if you are making the best use of your time at any given moment. You?ll learn how to prepare yourself mentally and physically to tackle the task at hand, along with strategies for dividing it into manageable segments to keep you moving forward. You?ll even find out what to tell yourself to do if you?re having trouble getting started, or become distracted and need to get back on track. ?